The General Motors Oshawa Assembly Plant has been building world class vehicles in Oshawa, Ontario, Canada since Nov. 7, 1953. General Motors is expected to announce on Monday the closure of the Oshawa Assembly Plant, according to The Globe and Mail. Located northeast of Toronto, the plant has a flex line that produces the low-volume Cadillac XTS and Chevrolet Impala, while the truck line finishes assembling the outgoing models of the light- and heavy-duty Chevrolet Silverado and GMC Sierra pickups. “I’m not sure it’s a closure,” he said later in a phone call. During 2016 contract negotiations with Unifor, General Motors pledged to spend $400 million to upgrade the consolidated line, allowing it to finish the trucks. Unifor is scheduled to hold a discussion with General Motors tomorrow and will provide further comment following the meeting. The offices of Prime Minister Justin Trudeau and Ontario Premier Doug Ford were informed of the decision late Sunday before the official announcement on Monday, The Globe and Mail reported. A Unifor official told Automotive News Canada that GM informed the union on a conference call Sunday afternoon about its intention to end of the truck line at the Oshawa plant, an announcement that has been expected for some time. However, the union said GM also was also “emitting severe signals” about the future of the GM Oshawa operation, and that Unifor National President Jerry Dias was preparing a statement. A spokeswoman for GM Canada told the Canadian Press that the company had no news to share Sunday night and would not comment on speculation. The offices of Prime Minister Justin Trudeau and Ontario Premier Doug Ford were informed of GM’s decision late Sunday before the official announcement on Monday, The Globe and Mail reported. Oshawa Mayor John Henry told The Canadian Press that he has seen published reports about closure of the Oshawa plant but hasn't heard from GM, which is the city's main employer. News of a looming closure was a surprise to two members of Parliament for the area. 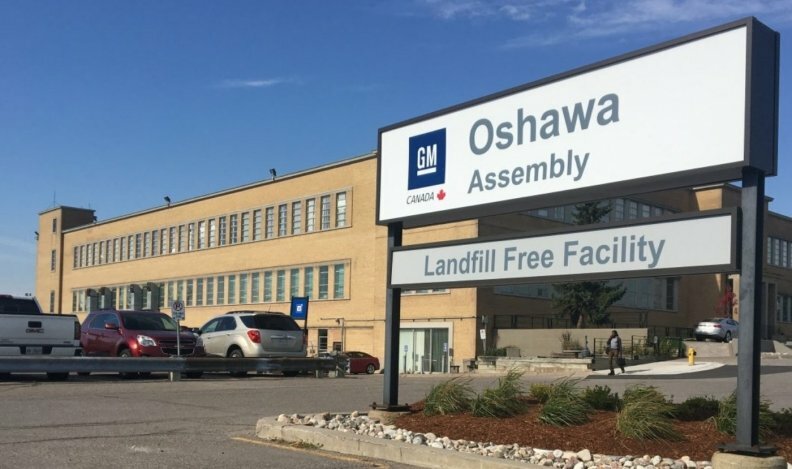 "Extremely concerned about reports regarding potential closure of GM Canada Oshawa operations," Erin O'Toole, Conservative MP for Durham wrote on Twitter. He said he and Oshawa MP Colin Carrie were looking for more information. Carrie also tweeted that the report was "very concerning." Jennifer French, who represents the city in the provincial legislature, says she finds the report of the plant closure "gravely concerning." "If GM Canada is indeed turning its back on 100 years of industry and community — abandoning workers and families in Oshawa then this is a callous decision that must be fought," she said in a statement. The future of the plant has become increasingly bleak as North American consumers shift away from cars and flock toward utility vehicles and trucks. GM had already said it will end XTS production in 2020. New Cadillac sedans — expected to be named CT4 and CT5 — will eventually replace the ATS, CTS and XTS. General Motors in June said it was investing US $175 million (Cdn $232 million) in a mid-Michigan plant to build two of Cadillac's next-generation sedans, but the automaker did not say how that will affect production at the Oshawa, Ont., assembly plant. Meanwhile, GM also builds the Impala at a factory in Michigan. GM has been expected to end production of the outgoing Chevrolet Silverado and GMC Sierra in Oshawa by the end of next year, with no replacement planned. Currently, through a process known as the "Oshawa shuttle program” unfinished Silverado and Sierra double cab bodies are shipped to Canada from a Fort Wayne, Ind., plant. The trucks are painted in the Oshawa plant and employees there perform final assembly. GM spent $400M to retrofit the plant to do this. The Oshawa shuttle started at the beginning of 2018. Heavy-duty pickups and a second production shift were added in the summer. The program, according to GM spokeswoman Kim Carpenter, is expected to "run into late 2019 based on market demand." She said the program has been a "great success" and is "on track to build more vehicles (60,000 a year) than the original forecast." The General Motors Oshawa Assembly Plant has been building world class vehicles in Oshawa, Ontario, Canada since November 7, 1953. Before 1953, the facility produced McLaughlin Buicks and became one of six locations building Chevrolet before it merged with GM in 1918. The automaker also operates the CAMI Assembly in Ingersoll builds the Chevy Equinox. GM also operates a propulsion factory in St. Catharines, Ont. ; technical centres in Oshawa and Markham, Ont. ; and a cold weather testing facility in Kapuskasing, Ont. The Canadian Press, Automotive News, Reuters, Grace Macaluso and Robert Bostelaar contributed to this report.